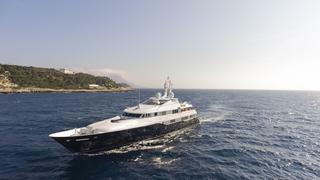 Charter yacht ODESSA is full of choice for entertainment and accommodation. ODESSA’s interior is effortlessly elegant, with a quiet sophistication pervading across the living areas and cabins, giving a relaxed feel throughout. The master suite and master suite’s convertible office are set on the main deck. The master suite is particularly spectacular with a king-size bed, dressing room, his and hers marble bath and panoramic views. Four extra cabins are available on the lower deck, two of which are convertible from doubles to twins. Meanwhile, the open-plan sun deck has a large shaded dining area where sumptuous meals are enjoyed day or night. A considerable benefit of chartering ODESSA is being served by her award-winning chef. In the evening, while there are several other areas for entertaining, guests can simply relax on the substantial lounging areas where a large screen TV is perfectly situated. The upper saloon is a wonderful alternative for night-time entertaining, with another large screen linked to the Kaleidescape system. ODESSA is an incredible yacht – whatever you want, she will deliver. Fully stocked for fun on the water, she carries a Castoldi jet tender, various towable and inflatable toys, waverunners, paddle boards and much more.